Mission San Luis Rey de Francia, also known as Mission San Luis Rey or San Luis Rey Mission Church, was founded on June 13, 1798 by Father Fermin Lasuén and named for Louis IX, King of France (1215-1270). The mission was eighteenth in the California Mission Chain and closed the critical gap between Mission San Diego and Mission San Juan Capistrano. Father Antonio Peyri was put in charge of Mission San Luis Rey from the day of its foundation until January 1832, when he left California. The Native Americans living near the mission, the Quechnajuichom tribe, were industrious and collaborative and, due to the high number of baptisms and conversions among them, they also became known as the Luiseño Mission Indians. By 1830, Mission San Luis Rey de Francia was self-sustaining and one of the biggest California Missions covering almost 6 acres (24,000 m2) and with more than three thousand Luiseño Indians living at its premises. Described as "gracious, dignified, and expressive", the mission church is an excellent example of what could be created with the help of Indian craftsmen when guided by a talented mission father such as Father Antonio Peyri. One interesting feature of the early mission was an elaborate sunken garden built in a little valley below the mission. Exotic fruits and shrubs grew there along with oranges, grapes, olives, wheat and corn. The water from the river just north of the mission was collected trough an ingenuous water supply system in order to irrigate the fields in the valley. The present church was begun in 1811 and dedicated in 1815. Local materials, such as adobe, fired clay bricks, and wooden timbers were used for the construction of the church which today is a National Historic Landmark. The plan of the church is cruciform, a structure design only used at one other mission, San Juan Capistrano. 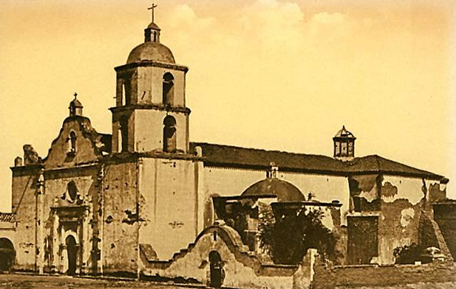 Mission San Luis Rey de Francia was secularized in 1833 and sold in 1846. In 1865, President Abraham Lincoln returned the mission to the Catholic Church. In 1893 the mission was rededicated and major reconstruction efforts followed soon after. In 1984, the exterior of the church building was restored. Today, archaeological investigations are still ongoing and the area is being excavated giving new insights about the early mission life. A small museum can be visited housing original paintings and sculptures of the mission. The first California Pepper tree, now a common sight throughout the state, was planted at this mission.